Maxine Marie Zollinger, 78, of Belton, Missouri, passed away peacefully on Wednesday, July 11th with family at her side. Maxine was born on July 21, 1939 in Hugo, Colorado to Omar Riley and Edrie Avis (Summers) Oster. She was the youngest of six children. While Omar Riley was her birth father, she claimed William J Oster as her Dad. After graduating high school, Maxine moved to the Denver area and worked as a bookkeeper. She met Willie Warnie Alley at the Western Drive Inn in Aurora, Colorado. They were married on April 2, 1960. Willie was a Technical Sergeant in the United States Air Force so the couple lived many places but considered Colorado their home. Upon his death in Vietnam on September 1, 1969, she moved herself and her three young children from Aurora to Hugo to be near family. In 1973, she met Ralph Orland Zollinger (aka Zolly & Hugo) while working as a waitress in Limon Colorado. The two married and combined families on July 31, 1974 in Goodland Kansas. 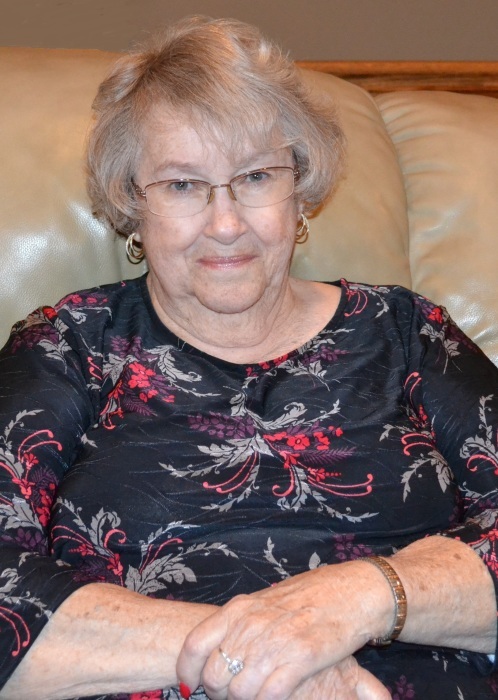 Maxine was both a homemaker and worked with USD 352 in Goodland as a bookkeeper and also served as the Board Treasurer. Her hobbies include bowling, reading, crocheting and baking. She loved to play computer games, especially POGO. She never denied the family when they wanted a burrito night, homemade dinner rolls or vacuum cleaner cookies. Just over a year following Orland’s death in 2008, Maxine moved to Hutchinson, Kansas to be closer to Connie and Bob, and a bit closer to Cyndy. She was an active participant at craft shows with Connie for many years. She remained there just over 8 years before moving in March 2018 to Belton Missouri to be near Cyndy. Maxine is preceded in death by both parents, Bill & Edrie, sister Patsy, brother James, both spouses, Bill & Orland and two grandchildren, Bryce & Krista Gotchall. Survivors include Maxine’s siblings, Jane Hoyt, Don & Joyce Riley and Virginia Chaffin all of Hugo Colorado, her 3 children with Willie, Bob (Marilyn) Zollinger, Ellinwood Kansas, Cyndy (Tim) Hurd, Peculiar Missouri and Connie Zollinger, Hutchinson Kansas. She is also survived by Orland’s 4 children, Paula (Dave) Krizek, Jennings Kansas, Donna (Dean) Fenner, Goodland Kansas, Carol (Larry) Gotchall, Schoenchen Kansas & Michael Zollinger, Clayton Kansas. Grandchildren include April (David) Hegarty, Matthew (Mindy) Zollinger, Hayley McKee, Brett Hurd, Emily Hurd, Joshua Zollinger, Edriana (Chuck Barrow) Zollinger, Devin Thomas, Jamie (Chad) Dolan, Justin Bolt, Tyler (Lisa) Bolt, Andrea (Eric) Lobmeyer, Derek (Trista) Fenner, Shayla Gotchall, Amanda (Joe) Strnad, & Savannah Zollinger and fiancé Chris. Great-Grandchildren include Zack, Riley, Addyson, Finley, Olivia L, Kodi, Gavyn, Blakely, Kaydee, Bryson, Maycee, Taylor, Kimber, Kaitlind, Olivia S, Kolby, Klayton, Kolin, Jada & Everlee.